"This series of ten or eleven prints - it is not certain whether a print of trout belongs tothe series or not - was originally commissioned by a poetry club. They were thus first issued as a de luxe kyōka folding albums and all the prints from the first edition... have a centerfold. Bokashi was added to the upper edge in later impressions..."
Quoted from: Hiroshige: Prints and Drawings by Matthi Forrer, Prestel, 1997, n.p., entry #82. 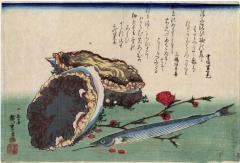 Keio University's digital web site give the motif description as 魚づくし 鮑とさより (Sakana-dzukushi awabi to sayori [according to the Google translator] - Fish Dzukushi abalone and Hyporhamphus sajori.